LONG AN – Long An Province, which produces about 215,000 tonnes of dragon fruit every year, is aiming to increase its exports of the fruit by using state-of-the-art technology to develop 2,000ha of new growing land in Châu Thành District. The plan, which the provincial agriculture department says will be completed by 2020, will expand the province’s dragon fruit-growing area from its current 9,200ha. The new cultivation area will produce pesticide-free dragon fruits. According to Long An Province’s Department of Agriculture and Rural Development, 80 per cent of Long An’s dragon fruit is sent to the Chinese market. Fifteen cent is consumed domestically, and the rest is sent to Japan, Thailand, USA and Europe. The price of dragon fruit in the Chinese market is considered unstable and determined by traders, so farmers would like to sell to a broader range of markets. Therefore, it is necessary to invest in different production methods that will allow the fruit to meet the standards set by importers like Japan, the US and the EU. In order to expand the dragon fruit-export market, the province has made detailed plan to develop growing areas according to GlobalGAP and VietGAP standard. Thanks to these strategic directions, Long An dragon fruits have been accepted by foreign markets such as Japan, South Korea, New Zealand and Taiwan, all of which have strict standards for produce safety. In order to implement the plan, the district developed two 5ha clean dragon fruit-growing models at the two co-operatives of Long Hội and Tầm Vu last year. The models grow dragon fruit following VietGAP (Vietnam Good Agricultural Practices) standards, using organic fertilizers, bio-fertilizers, bio-products and insect traps. This year, the district has implemented six pilot models with a total area of 145.2 ha. At the pilot sites, staff have guided farmers to use organic fertilizers, bio-fertilizers, probiotics and advanced technology for grafting. Another pilot area in Long Tri Commune applies an advanced irrigation system for dragon fruit trees on acreage of 5,000 sq.m. Nguyễn Văn Phi, a farmer who was participating in a pilot dragon fruit project at An Lục Long Commune, said that using the VietGAP-standard model was costly but the consumption market was guaranteed. Phi said all the dragon fruits produced at An Lục Long Commune’s pilot project were purchased by Hoàng Phát Ltd.Co. Võ Văn Vấn, head of Châu Thành District’s Agriculture Office, said the local agricultural sector has implemented VietGAP standards on 700ha of dragon fruit cultivation area, with the participation of 1,800 families. "Although the implementation of the project has coped with difficulties, including a lack of fertilizer storage, pesticides and the field-cleaning process, I believe that the project is moving in the right direction," he said. Lê Văn Hoàng, Director of Long An Province’s Department of Agriculture and Rural Development, said that in the current market, farmers must move to clean agriculture and high technology, aiming at stabilizing output and improving the value of their products. However, according to the Department, the expansion of the clean dragon fruit-growing model was difficult because it requires a large amount of money from farmers who wanted to participate in the project. For example, the model at Long Trì Commune asked farmers to contribute 70 per cent of the total investment, while the Central budget covered 30 per cent. The province also has no policy or budget to implement the VietGAP dragon fruit projects. 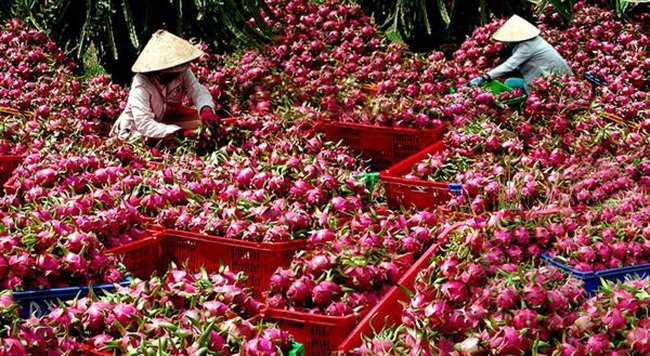 According to Phạm Văn Cảnh, Deputy Chairman of Long An Provincial People’s Committee, the province will direct the agriculture department and grass-roots authorities and guide farmers and enterprises to improve production capacity and pack dragon fruits according to export standards. Currently, Châu Thành District is home to four companies, three enterprises, four cooperatives and 107 gardens involved in dragon fruit production.